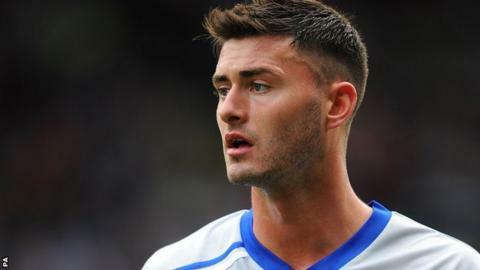 Carlisle United striker Gary Madine has thanked the fans for their backing since he rejoined the club on loan from Sheffield Wednesday last week. The 23-year-old, who began his career at Brunton Park, was for assaulting two football supporters. He was released from prison last month, and started for Carlisle in their on Saturday. Carlisle United currently have eight players on loan in Jordan Pickford, Conor Townsend, Reece Brown, Luke Dawson, Danny Redmond, Gary Madine, Sam Byrne and James Pearson. Football League rules stipulate a maximum of five loanees can be included in a match-day squad. "Thankfully the fans were great but I wasn't sure of the reaction. Hopefully I'll be firing soon," he said. "The supporters were singing my name and really made me feel welcome again. "Some of the other players were laughing about it, saying the stand was full of my mates." Carlisle are winless in eight matches, during which time they have scored just three goals and slipped into the League One relegation zone. Madine played for the Cumbrians from 2007 to 2011, netting 21 times in 85 matches. Last September he trained with the club prior to being sentenced. "I know there'll be some abuse but I'm ready to just get on with my football now," Madine told BBC Radio Cumbria. "Kav knows what I need, he's been brilliant for me with his arm round my shoulder. Hopefully I can be on all cylinders within a couple of weeks."